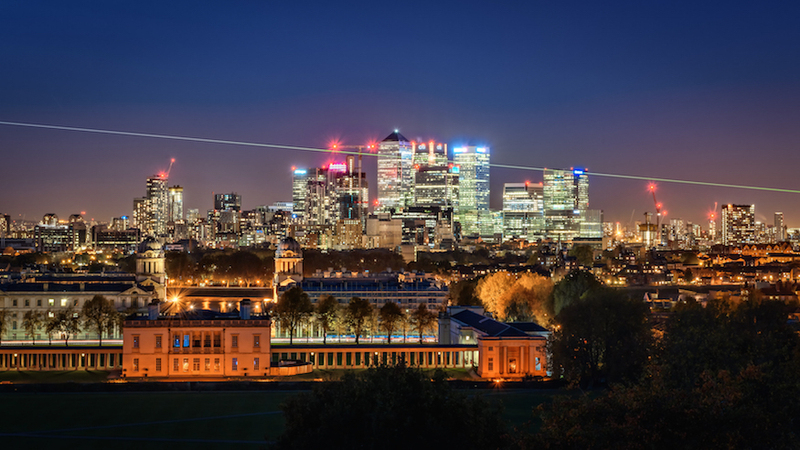 Ever trekked up to the Royal Observatory in Greenwich to stand on the Meridian line? You wasted your time — there are plenty of other places around London and beyond where the course of the Meridian line is marked in some way. 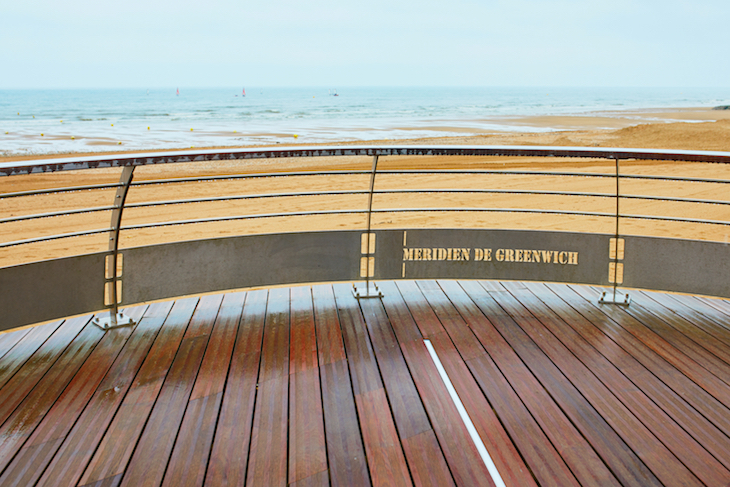 What is the Greenwich Meridian Line? It's basically an invisible line which splits the Earth into east and west in the same way that the Equator splits it into north and south. It runs right through the Royal Observatory, and sits on zero longitude — all other measurements of longitude across the globe are taken from this point. One of our favourite places to spot the Meridian line is near Hither Green stations. Unless you live nearby, you've probably never used the underpass by the station entrance. But if you are in this neck of the woods, look up as you walk through the tunnel from the Staplehurst Road side. The arched ceiling is adorned with a diagonal metal line, announcing itself as the Meridian line. When we went to take a look (yes, this sort of thing is exactly how we spend our weekends), an elderly couple walking through the tunnel stopped to see what we were photographing. They were locals who use the tunnel on a regular basis, but had never noticed it before. While you're in Hither Green, drop by You Don't Bring Me Flowers — the cafe-florist is a fab place to wile away an hour, or just swing by for a quick coffee. Not too far away, this plaque sits on East India Dock Road, with this one on the opposite side of the road. Where else can I see the Meridian line? 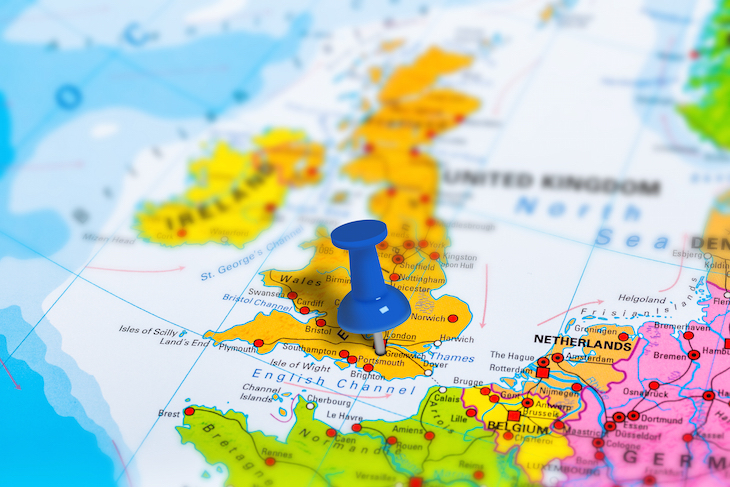 Many, many places in England, running from Brighton up to Kingston-Upon-Hull, via Ware, Cambridge, Boston and Grimsby (as well as France, Spain, Algeria, Mali, Burkina Faso, Togo, Ghana and Antarctica). This map shows all the ways in which the line has been marked, from plaques on the pavement to arches, clocks, sculptures, and even businesses and buildings that have been named after it. Some are no longer visible, but still feature on the map. 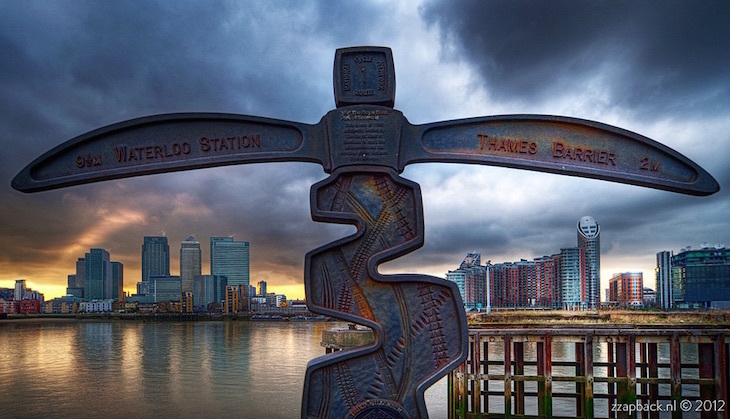 There are too many for us to cover all of them, so scroll down for information about some of the more interesting, unusual and accessible ways in which the Meridian line has been marked in London. 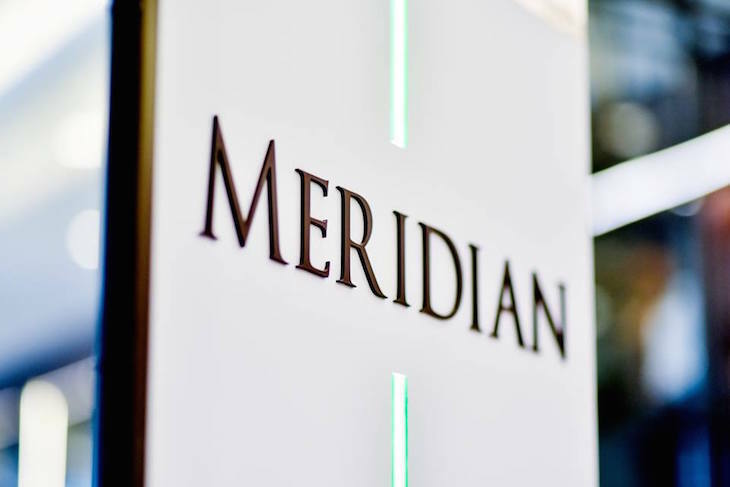 The Meridian line runs right through the aptly-named Meridian Lounge at the InterContinental Hotel in Greenwich — it's even marked on a pillar in the restaurant. 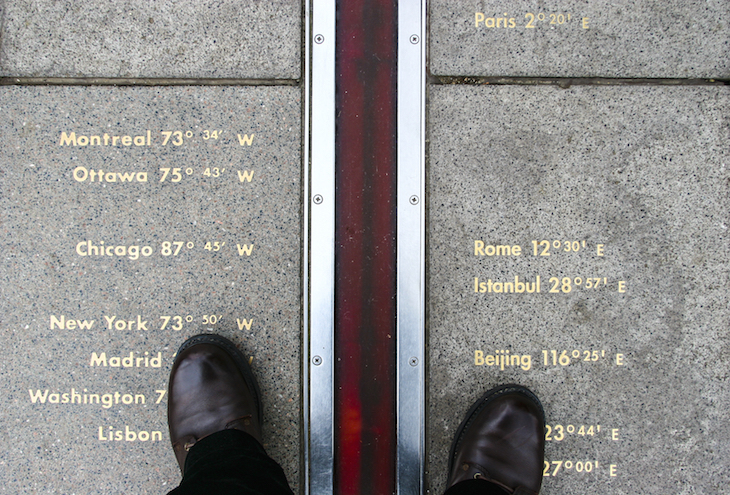 A surprising number of schools have the Meridian line running right through their property, and several have chosen to make a feature of it. Meridian Primary School in Greenwich marks the line on the playground, and right through the classrooms too. Sandhurst Junior School in Catford also marks it on the playground. A blue line dissects the otherwise green tennis courts in Greenwich Park. At the junction of Hither Green Lane and Woodlands Street in Hither Green, the Meridian line takes a shortcut across a small, paved area. Farnaby Road in is home to both a marker post, installed for the millennium, and a pavement plaque, on which the new post stands. The Prime Meridian Walk cuts through Newport Avenue in Poplar, marked by a line on the ground. The north of London is littered with these plaques, all in various dates of disrepair, following the route of the Meridian line. They're all mapped here. There were plans for a Millennium Tree Line — a row of trees, planted through London following the course of the Meridian, to mark the turn of the millennium. Ultimately, the project failed (more on that here), and the few trees that were planted for the project were mainly in private gardens. One house in West Wickham has a plaque replacing a tree which was planted as part of the project. On the Thames Path round the back of the O2, between branches of the Blackwall Tunnel, you'll find the above sign. It shows how far you are from Waterloo station in one direction and the Thames Barrier in the other, but more importantly, it is positioned right on the Meridian line. Close to the above sign, you'll find a road sign reading "Here 24,859". Originally created for an art exhibition, it's now part of The Line Sculpture Trail. 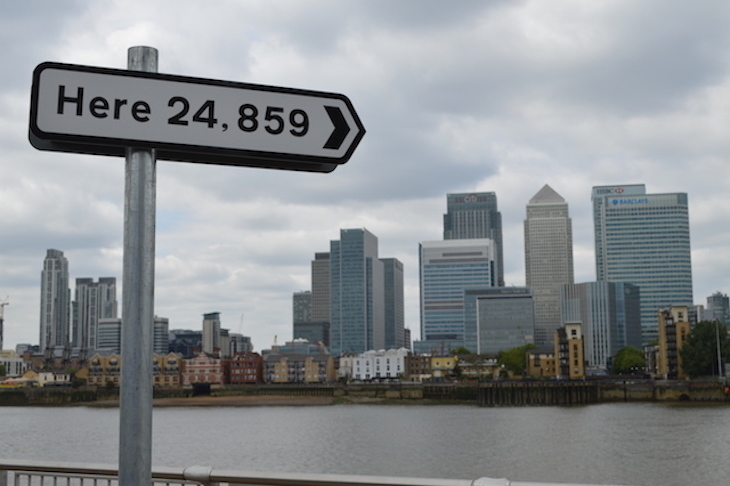 24,859 refers to the number of miles you'd need to travel around the world to end up back in the same place, so it was aptly placed on the Meridian line. A sundial juts into the boating lake in Greenwich Park. It was built for the millennium, and lines up with the Meridian line. Coney Hall Recreation Ground in West Wickham is home to a small obelisk marking the Meridian line's route through the borough of Bromley. At the top of Pole Hill in Chingford, two obelisks line up with the Meridian line. Being such a high point, the obelisks were previously used by geographers and astronomers at the Greenwich Observatory to line up their equipment. Know of any other impressive Meridian markers in London? Let us know in the comments.